Yesterday, I told my daughter Tina, oh Unich (she changed her nickname) to collect our pics and compressed them into one. I bet this technique is called "collage". Oh if you disagree with me then find the meaning of "collage" in dictionary.com. For me, that is the proper terminology. It looks tremendous. 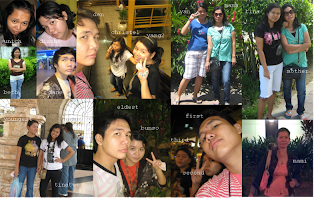 Pictures of me, my kids, Dane Christian, Dawn Christel (Unich) and bunso Dianne Chrisha (Yang2). I called the pic "WE ARE FAMILY". Family is a great foundation in building up relationship with our children. This is where we start the fundamentals of love, caring, affection, understanding, forgiveness, prayers. Family is an intuition. It is like school that we teach our kids to develop a kind of attitude that would be beneficial not only within that institution but how to establish too harmonious relationship outside the family. We have noticed that children that came from a broken family resulted to vices such as drugs, liquors and violence because nobody cares, nobody listens. There is an exemption to the rule though. There are kids that came from a broken family or being brought-up by a single parent yet the child can mingle with the society, community and other people in the most cultured, civilized manners. I say in this line, parents has a great role molding the minds of children. We have to lead by examples and instilling in their minds the positive side of life and to be God-fearing.We can teach a better sermon in action than in speaking. I cannot say that I am a perfect mother. I have my own frailties. I sometimes too get impatient with my children. I ask too myself, I I can overcome the problems in raising them. I seek God's advise usually by means of prayer that I will be relieved and go on with the test of time. I keep on advising my children what is good for them and what is bad for them. We have to maintain equilibrium in the institution of family. No bias when it comes to treatment of the kids and know how to deal with them when they have tantrums. I don't want to quote- out- of context other families because in every family, they have different kind of upbringing their children. We have one family building for a better foundation. Surmounting the trial and difficulties that may happen along the way. Accepting the challenges of life.